The Friends of the Library invite library and book lovers to join us in supporting the Lake Whitney Public Library. While your support may be strictly monetary there are many volunteer opportunities as well. Many members donate both time and talent. As a Friend you receive early bird privileges, recognition for your support and contributions, permission to check out 10 books at a time and much more! Friends of the Lake Whitney Public Library is a non-profit membership organization which exists to support the surrounding community. They raise money for non-budgeted items for the library. 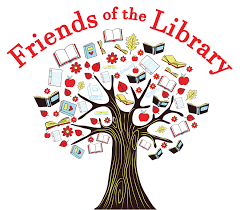 Friends of the Library supports the Whitney Library through annual membership dues and special activities such as the library book sale and book donations. Any funds raised by the Friends can be put to use by providing funding for programs, such as Wednesday Story Time and Summer Reading program. Friends also help purchase special books, equipment, and furniture that the library requires to better serve the community. •Stimulate public support of the Library. You will need Adobe Reader to view the document. Click below for the free download.